I have moved so much in my lifetime that I have never really felt like I am part of a community so there is a space in my heart for books that feature a warm community strongly. And Chance Nebraska is just such a community. They have a tiny issue about being a hurricane magnet but everyone there knows that someone has their back. It's a heartwarming feeling. And I really liked everyone in the community. Now I know that if I lived there, there would be spats among the residents what with someone playing their music too loud or not cutting their grass short enough but liking the residents is a good place to start from. 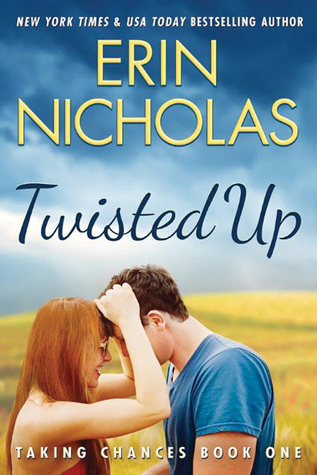 TWISTED UP focuses on Jake who is the town's golden boy and Avery who is the fire chief. They have known each other since they were kids but they became romantically involved just in time for Jake to leave for basic training. They haven't had a lot to do with each other since thought there are sparks there. This is a book that will give the readers a warm, fuzzy feeling but I did have an issue with one premise in the book. That is that Avery who is a strong professional woman can't seem to keep herself from kissing Jake. She might not want to kiss him but stating that she isn't able to physically keep herself from kissing anyone is bogus. Other then that little kibitz, I would definitely recommend this book to my readers who are looking for a feel good contemporary romance. I know that I am looking forward to the next book in this series to come out.